1. L. Trujillo, O. Schuetze, Y. Maldonado, P. Valle. NEO 2017 - Results of the Numerical and Evolutionary Optimization Workshop NEO 2017 held on September 27 to 29 in Tijuana, Mexico. Studies in Computational Intelligence, Springer, 2019. 2. Y. Maldonado, L. Trujillo, O. Schuetze, A. Riccardi and M. Vasile. NEO 2016 - Results of the Numerical and Evolutionary Optimization Workshop NEO 2016 and the NEO Cities 2016 Workshop held on September 20-24, 2016 in Tlalnepantla, Mexico. Studies in Computational Intelligence, Springer, 2017. 3. O. Schütze, L. Trujillo, P. Legrand, and Y. Maldonado. 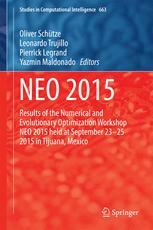 NEO 2015 - Results of the Numerical and Evolutionary Optimization Workshop NEO 2015 held at September 23-25 2015 in Tijuana, Mexico. Studies in Computational Intelligence, Springer, 2016. 4. H. Trautmann, G. Rudolph, K. Klamroth, O. Schütze, M. Wiecek, Y. Jin and C. Grimme. 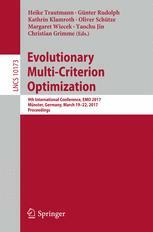 Evolutionary Multi-Criterion Optimization - 9th International Conference, EMO 2017, Münster, Germany, March 19-22, 2017, Proceedings. Lecture Notes in Computer Science. Springer, 2017. 5. M. Emmerich, A. Deutz, O.Schütze, E. Tantar, A. A. Tantar and P. Legrand. EVOLVE - A Bridge between Probability, Set Oriented Numerics Evolutionary Computation VII. Studies in Computational Intelligence, Springer, 2017. 6. A. A. Tantar, E. Tantar, J.Q. Sun, W. Zhang, O. Schütze, M. Emmerich, P. Legrand, P. del Moral, and C. A. Coello Coello. EVOLVE - A Bridge between Probability, Set Oriented Numerics, and Evolutionary Computation V. Advances in Intelligent Systems and Computing, Springer, 2014. 7. M. Emmerich, A. Deutz, O.Schütze, T. Bäck, E. Tantar, A. A. Tantar, P. Del Moral, P. Legrand, P. Bouvry, and C. A. Coello Coello. EVOLVE - A Bridge between Probability, Set Oriented Numerics Evolutionary Computation IV. Advances in Intelligent Systems and Computing, Springer, 2014. 8. O. Schütze, C. A. Coello Coello, A.-A. Tantar, E. Tantar, P. Bouvry, P. Del Moral, and P. Legrand. EVOLVE - A Bridge between Probability, Set Oriented Numerics and Evolutionary Computation III. Studies in Computational Intelligence, Springer, 2013. 9. O. Schütze, C. A. Coello Coello, A.-A. Tantar, E. Tantar, P. Bouvry, P. Del Moral, P. Legrand. EVOLVE - A Bridge between Probability, Set Oriented Numerics and Evolutionary Computation II. Advances in Intelligent Systems and Computing, Springer, 2013. 10. E. Tantar, A.-A. Tantar, P. Bouvry, P. Del Moral, P. Legrand, C. A. Coello Coello, and O. Schütze. EVOLVE - A Bridge between Probability, Set Oriented Numerics and Evolutionary Computation. Studies in Computational Intelligence, Springer, 2013.